ORIENTATION: Career decision-making in the 21st century is increasingly guided by the individuals' deep-seated values and career orientations, as they are required to become proactive career agents in the pursuit of their career. RESEARCH PURPOSE: The objective of the study was to explore the relationship between individuals' archetypal values (measured by the Pearson-Marr Archetype Indicator) and career orientations (measured by the Career Orientations Inventory). The study also assessed the differences between race, gender, marital status, employment status and age groups regarding the archetypal values and career orientations of the individuals. MOTIVATION FOR STUDY: Career counsellors and industrial psychologists are increasingly required to explore new career guidance frameworks that are relevant and appropriate to the evolving nature of careers. RESEARCH DESIGN, APPROACH AND METHOD: A quantitative survey was conducted. A non-probability sample of 207 voluntary participants employed within the science and engineering sector was obtained. MAIN FINDINGS: Correlational analyses revealed that the participants' archetypal values related significantly to their career orientations. The various biographical groups differed significantly regarding their archetypal values and career orientations. PRACTICAL/MANAGERIAL IMPLICATIONS: The findings highlight the importance of understanding the deep-seated archetypal values that seem to explain the individuals' career choices and decisions, and how these values differ regarding these choices and decisions. CONTRIBUTION/VALUE-ADD: The explanatory utility of the results may prove useful to enhance the individuals' self-insight in their career choices and experiences. This study represents original research that contributes new knowledge to the field of career psychology and career counselling practices. Interest in the nature of careers has escalated in recent times, driven by the need of researchers and career counsellors to understand and define the 21st century career (Hess & Jepsen, 2009). The importance of careers has also increased as the world has become more global, complex, uncertain, diverse and individualistic (Gunz & Peiperl, 2007). Individuals are increasingly required to manage their own careers and take personal responsibility for learning and adapting to the context of their careers (Fugate, Kinicki & Ashforth, 2004). Individuals are required to become proactive career agents in their pursuit to create meaningful lives and careers for themselves in a world characterised by chaotic uncertainty (Schreuder & Coetzee, 2011). These demands on the individuals have led to a renewed interest in the motivations and driving forces patterning individuals' career development over time (Maree, 2010). In agreement with this, Maree (2010) and Savickas et al. (2009) state that the attention given to understanding the values and motives underlying the individuals' career decisions and choices, is a prominent focus in post modern career counselling and guidance practices today. In the light of the foregoing trends, this research sets out to determine the relationship between two constructs that form part of the foregoing trends in individual career decision making and career counselling, namely archetypal values and career orientations. Research suggests that in the pursuit of creating meaningful lives and careers, individuals are looking at careers from a different perspective and tend to be motivated more by self-interest. This self-interest is in their personal lives, and subjective experiences relating to their careers, rather than their organisational survival and organisational accumulation of wealth (Inkson & Arthur, 2001; Savickas, 2005). People seem to use their internal values, goals, and desires to guide their evaluations of their actions and career decisions in the construction of their careers (Schreuder & Coetzee, 2011; Schwartz, 1999). In constructing a career, individuals engage in an ongoing process of adaptation to enhance the match between self and situation and to better realise their self-concept in work (Hartung, 2007). The values driving career decision-making constitute the major ingredient in personal career development (Miller & Miller, 2005), and counsellors need to understand the values that underlie the individuals' career motives and orientations in order to provide meaningful guidance. As diversity in workplaces has become a key characteristic of the contemporary organisation, career counsellors are also increasingly required to facilitate personal career development for clients from different backgrounds and in different stages of life (Coetzee & Roythorne-Jacobs, 2012). Research further recognises that the individuals' personal perspectives provide the framework for career development. In this personal perspective careers, are only one of several aspects of personal development for the individual (Tams & Arthur, 2010). Individuals' dominant life themes and career orientations represent some of the core values driving their personal and career development (Wrzesniewski, 2002). Savickas (2005) argues that the individuals' personal life stories are used as a carrier of meaning (or holding space), during times of transition, to facilitate continuity in a chaotic and fragmented world. In a post-modern society, the focus of career counselling has, therefore, shifted to helping clients give meaning and purpose to their vocations in life. This is achieved by guiding them to reflect on the motivations and driving forces that pattern their dominant life themes and orientations during the various stages of their personal life journeys (Savickas, 2005). Carol Pearson's (1991) archetypal hero's journey provides a framework for insight into the journey of long-term personal development within the careers context. According to Pearson and Marr (2002), archetypes relate to the desires and motivations common to human beings in all cultural contexts. The archetypal framework helps individuals to identify and understand the archetypal values underlying the dominant life themes active in their lives at a given time, and helps them to gain insight into the direction, needs and potential obstacles to growth and development present in their lives at that time (Pearson & Marr, 2003). The concept of archetypes presents ways of understanding and organising human experience and has previously been applied within a limited number of studies within the careers context (Carr, 2002). It is believed that career counsellors can contribute to the enhancement of the individual's growth and development through attaining an understanding of archetypal theory and its relation to personal development within the careers context (Pearson & Marr, 2003). Schein's (1978) career orientations theory, also referred to as career anchors, provides insight into the values that drive career decisions of people. Career anchors are described as patterns of self-perceived talents and abilities, basic values, motives and needs that pertain to careers and that influence individuals' career related decisions (Coetzee & Schreuder, 2009a; Feldman & Bolino, 1996; Greenhaus, Callanan & Godshalk, 2010). Individuals' career anchors, or underlying interests, motives and values serve the path that guides them in their decision-making (Coetzee & Schreuder, 2009a). Empirical evidence suggests that when individuals achieve congruence between their career anchors and their work environment, they are more likely to achieve positive career outcomes (Feldman & Bolino, 1996). Furthermore, research also indicates individuals' need for congruence between their work and personal interests, and that individual preferences shift towards career anchors which are focused on the pursuit of personal interests, along with meaningful work (Coetzee & Schreuder, 2008). Individuals decide on career changes based on personal preferences and current circumstances (Coetzee, Schreuder & Tladinyane, 2007; Hess & Jepsen, 2009). However, research on the relationship between individuals' archetypal values and their career orientations seems to be limited. This study, therefore, aims to add to the careers literature by investigating the relationship between these constructs with the view to inform career counselling practices in the contemporary multi-cultural workplace context. Pearson's (1991) archetypal model of adult development is used as a framework for studying individuals' archetypal values in this study. The model is not designed to categorise people according to particular archetypes. As an extension of Jung's (1968) archetype concept, Pearson's (1991) model uses the metaphor of the 'heroic journey' in order to provide an understanding of the universal challenges and tasks related to adult development. As shown in Table 1, the heroic archetypes are defined as twelve broad emotional, cognitive, and behavioural styles, each with their own psychological theme and their underlying goals, values, and desires (Pearson & Marr, 2003). Understanding which of the archetypes is active in a person's life enables the identification of psychological needs and potential developmental blocks related to the particular life phase. The archetypal theory also allows for an understanding of the direction of personal development (Du Toit, 2010). Pearson's (1991) twelve archetype model is a spiral developmental model and is more complex than linear developmental models which contain set sequences of archetypes. Individuals encounter the same archetypes at different levels of integration as personal development progresses along the adult life journey. Combining adult development and the cognitive state, the twelve archetypes are ways of cognitively and emotionally organising life events and experiences in certain preferred manners represented by themes common to all cultures. As such they are typically called forth to handle particular life tasks. Although some archetypes may provide the basis for a person's core story, others will flow in and out of his or her life in ways appropriate to life stages, circumstances, challenges as well as to the unique quality of mind and soul of the individual involved. In this regard, attention to the archetypes in individuals' lives may both help one discover some fundamental source of meaning and track where one is on one's life journey (Pearson & Marr, 2003). 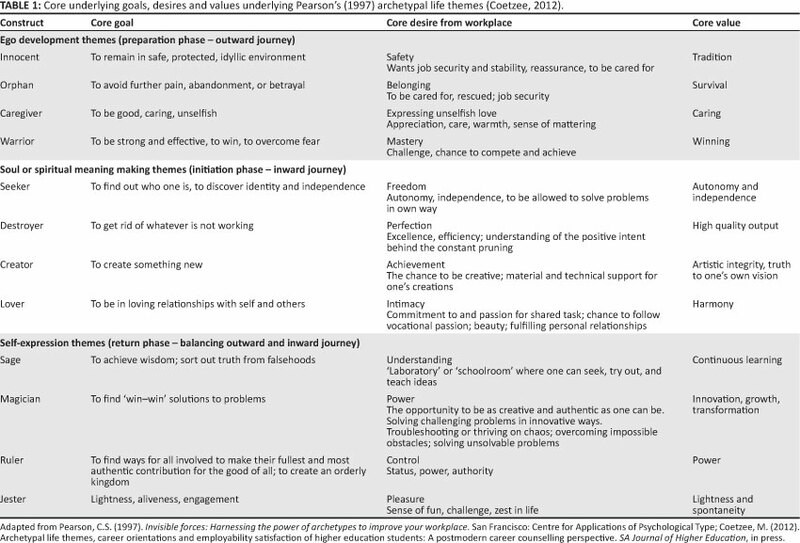 As shown in Table 1, the archetypes of the 'hero' (or adult) are developmentally clustered as three groups of four: firstly, the ego or preparation phase of the adult's or hero's life journey (composed of the innocent, orphan, caregiver, and warrior), secondly, the soul or the initiation and meaning-making phase of the internal journey of the hero (composed of the seeker, lover, creator and destroyer), and, thirdly, the self which is regarded as the balancing point of the entire psyche (composed of the ruler, magician, sage and jester). The ego phase is usually encountered in greatest measure in young adulthood, regarded as the beginning of the adult journey, and the phase of establishing oneself and one's ways in the external world. As a person becomes established, he or she often reaches a time of searching, which is a revisiting of the creation of identity and meaning with the internal life and internal soul journey becoming a prominent focus. Having experienced both an outward (ego) and an inward (soul) journey, a person becomes increasingly able to manage and balance the outward and inward life (integrating and expressing the self more fully) (Pearson & Marr, 2003). Schein's (1978) well-known career anchors theory describes career orientations of people. Schein (1985, p. 28) defines career anchors as 'the set of self-perceptions pertaining to individuals, firstly, as motives and needs, secondly, as talents and skills, and , thirdly, as personal values that they would not give up if they were forced to make a choice'. Career anchor theory provides a model of career development that takes into consideration the complexity of career development. The self-concept is central to Schein's (1978) career anchor theory and represents individuals' knowledge of their skills and talents, their understanding of what is important to the self, and their motives or values that serve as an internal driving force when making career decisions (Coetzee & Schreuder, 2009b; Kanye & Crous, 2007; Schein, 1985; Van Vuuren & Fourie, 2000). Career anchors tend to develop over time and individuals generally discover their career anchors only after having worked for some time (Coetzee & Schreuder, 2009a, 2009b; Ellison & Schreuder, 2000; Van Vuuren & Fourie, 2000). The self-concept is continuously developed based on the insight gained through knowledge and experience (Schein, 2006b).  security or stability, the need for job security (associated with benefit packages and long-term employment) in an organisation and stability in a geographical area. Table 2 provides a brief overview of the core goals, desires and values underlying each of the eight career anchors. In accordance with Jung's (1968) archetypal theory of the psyche, the archetypal values underlying Pearson's (1991) twelve archetypes form part of the content of the collective unconscious and are generated from repeated experiences of earlier generations. The career orientations included in Schein's (1978) career anchor theory are hypothesised to form part of the conscious content of the psyche. This hypothesis is motivated by the fact that Schein's (1978) career anchors are based on an individual's experience, systematic self-diagnosis and self-insight and their interests and abilities. These career anchors are stabilising and consistent values that influence decision-making (Du Toit, 2010). The characteristics of career anchors are consistent with Jung's (1968) conceptualisation of the conscious, including an individual's process of structuring reality, and the structuring and creation of an individual's awareness of him or herself. Jung (1968) further proposed that the individual constructs an identity of themselves through the internal functioning of the conscious, whilst Schein (2006b) consistently states that career anchors consist of an individual's personal view of themselves, their view of their life and their self-concept. Therefore, the inclusion of career anchors as part of the conscious seems to be consistent with both Jung's (1961) conception of the psyche and with Schein's (1978) conception of career anchors. Pearson's (1991) theory of archetypes suggests that the innocent and the orphan archetypal values have a close relationship with the security or stability career orientations. The innocent archetype describes an individual who is dependent on others for care and safety (Pearson, 1991). Individuals with this archetype prominent within their lives, expect organisations to provide them with safety and care for the entirety of their careers. The security or stability career orientation is also associated with a strong need for a stable career and is often reflected as a search for financial and geographical security (Schein, 2006b). Security or stability is a prominent career anchor for individuals in the context of volatile economic situations and increasing unemployment (Erdogmus, 2004). The creator and magician archetypal values may be related to the entrepreneurial creativity career orientation. The creator archetype is characterised by inspiration and creativity (Pearson, 1991). Individuals with this archetypal value present in their lives have a vision of their future, and wish to play an active role in creating the future they envision for themselves (Pearson, 1991). The magician archetypal value is mainly concerned with transformation and creating an environment that is conducive to the growth of others (Pearson, 1991). The entrepreneurial creativity career orientation is driven by the desire to create or build something new (Schein, 1985; 2006b). The seeker and destroyer archetypal values may be related to the autonomy or independence and pure challenge career orientations. Individuals with the seeker prominent in their lives experience conflict between individuation and conformity (Pearson, 1991). The destroyer enables an individual to let go of things that do not support his or her goals (Pearson, 1991). Through the activation of the destroyer archetypal value individuals can create a better environment for themselves (Pearson, 1991). The autonomy or independence career orientation is associated with a desire to be free from organisational restrictions (Schein, 1985; 2006b). Individuals with this value become frustrated with rules and regulations, and seemingly senseless routine tasks (Schein, 1985; 2006b). Individuals with this career orientation are driven by their desire to live according to their own choices (Feldman & Bolino, 2000). The pure challenge career orientation involves solving problems and being challenged within a career. Failure to be challenged leads to boredom and frustration (Schein, 1985; 2006b). The warrior and the ruler archetypal values appear to be related to the general managerial competence career orientation. The warrior archetypal value is characterised by goal attainment and carefully formulated plans (Pearson & Marr, 2003). In the organisational context the warrior archetype enables individuals to assert and protect themselves and is also associated with excellent performance (Pearson, 1991). When the ruler archetypal value is dominant within an individual's life, they are concerned with forming a vision and setting goals (Pearson & Marr, 2003). The ruler archetype is also associated with power and using power in a responsible manner (Pearson, 1991). Within the work environment the ruler is often seen as a culmination of experience and knowledge and represents the management and leadership roles that an individual fulfils (Pearson, 1997). The general managerial competence career orientation involves a desire to amalgamate the efforts of different people (Schein, 2006b). Individuals who hold this career orientation are often drawn to roles with power and responsibility that enable them to use their interpersonal skills (Schein, 1985; 2006b). The lover and the caregiver archetypal values seem to be related to the service or dedication to a cause career orientation. The lover archetypal value represents relationships and commitment (Pearson, 1991). The lover becomes evident when an individual experiences his or her career as a calling (Pearson, 1998). The caregiver archetypal value is mainly concerned with nuturance, comfort and encouragement (Pearson & Marr, 2003). When this archetype is activated within an individual, the focus is on caring for others and making a difference in people's lives and the world in general (Pearson, 1998). People who hold the service or dedication to a cause career orientation are driven to achieve value in the areas of the world where they are involved (Schein, 1985; 2006). These individuals' main concern is helping others. They view their careers as a calling and possess a strong sense of purpose (Coetzee & Schreuder, 2009b). The jester archetypal value appears to be associated with the lifestyle integration career orientation. The jester archetypal value inspires enjoyment of life and focuses on the process of reaching goals instead of just focusing on attaining goals (Pearson, 1991). The jester also allows individuals to express themselves in a manner that is true to the self (Pearson, 1991). The lifestyle integration career orientation is mainly concerned with the integration of various aspects of an individual's life. These individuals strive to achieve a balance between work, life, family and friends (Schein, 1985; 2006b). The sage archetypal value seems to be related to the technical or functional competence career orientation. The sage seeks for a deeper understanding of people, life and issues without wishing to control or change these factors (Pearson, 1991). The sage is evident within specialists or experts who use this archetypal value to understand research problems by focusing on a specific field of study (Pearson, 1997). Individuals who hold the technical or functional competence career orientation place high value on their skills and link their sense of identity to challenges in their field (Schein, 1985; 2006b). These individuals find intrinsic meaning in their careers and see their careers as an extension of themselves and their talents (Schein, 1985; 2006b). Whereas individuals' dominant career anchors tend to remain relatively stable once a level of stabilisation is reached in their jobs or careers (Schein, 1985), their archetypal life themes change over time as they encounter new situations and evolve as human beings (Pearson & Marr, 2003). Research revealed that race groups differ according to their archetypal values (Pearson & Marr, 2003) but not in terms of their career anchors (Coetzee, 2008). Pearson (1991) reports gender difference in archetypal values. However, the information regarding gender differences in career orientations is contradictory. Danzinger and Valency (2006) found differences between gender groups, whilst Coetzee and Schreuder (2008) found no significant differences between gender groups. The theoretical framework presented in the previous section suggests that the constructs of archetypal values and career orientations are conceptually related. The objective of the study was, therefore, to explore the relationship between individuals' archetypal values and career orientations, and to measure the differences in the archetypal values and career orientations of different race, gender, marital status, employment status and age groups within the South African organisational context. This study extends the research on the internal career. Understanding the relationships between these variables could provide valuable insights about career counselling frameworks that address the changing needs of clients in a post-modern multi-cultural society. A field survey was utilised to obtain primary data, which were used to investigate the research objectives. A cross-section approach to data gathering was used. A non-probability sample of 207 individuals, employed as scientists and engineers by an organisation within the science and engineering sector, participated in the study. Regarding racial composition, the sample consisted of 63% Black people (53% African people; 5% Coloured people; 5% Indian people) and 37% White people. The participants comprised 60% males and 40% females. The participants were predominantly in their early career life stages, with 46% of the sample between the age of 26 and 40 years old; 37% of the sample were 25 years and younger; 14% were aged between 41 and 55 years; and 3% of the sample were 56 years and older. The participants had a relatively high educational level, with 26% having attained post-graduate level qualifications and 47% having attained a degree, diploma or certificate-level higher education qualification. The Pearson-Marr Archetype Indicator (Pearson & Marr, 2003) was used to measure archetypal values, and the Career Orientations Inventory (Schein, 2006a) was used to measure career orientations. 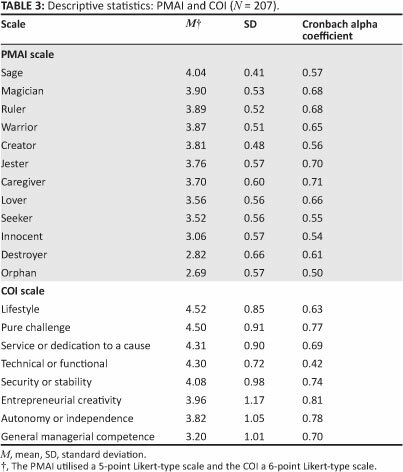 The Pearson-Marr Archetype Indicator (PMAI) is a self-rated, multi-factorial measure that contains 12 subscales (innocent, orphan, seeker, warrior, caregiver, destroyer, creator, lover, sage, magician, ruler and jester) consisting of a total of 72 items. Responses were measured on a 5-point Likerttype scale. Acceptable internal consistency reliability and construct and factorial validity were evidenced by Pearson and Marr (2003) who report Cronbach's alpha coefficients of 0.57 (innocent), 0.71 (orphan), 0.70 (warrior), 0.73 (caregiver), 0.61 (seeker), 0.66 (destroyer), 0.71 (lover), 0.67 (creator), 0.69 (ruler), 0.67 (magician), 0.61 (sage) and 0.76 (jester). A South African study conducted by Els (2004) reported acceptable levels of internal consistency for most of the archetypes, varying from 0.51 (innocent) to 0.71 (caregiver and ruler). The exception was the seeker archetype which had yielded a Cronbach's alpha coefficient of 0.36. As the PMAI has not been standardised for South African populations, scale reliabilities were conducted for the sample group. In the present study, the Cronbach's alpha coefficients (internal-consistency coefficients) for the subscales ranged from 0.50 to 0.71. The relatively low reliability coefficients obtained for the PMAI were taken into account in the interpretation of the results. The Career Orientations Inventory (COI) (Schein, 2006a) is an established instrument that has been used to measure career orientations both internationally and in South Africa. The COI is a self-report measure that contains 40 items. Responses were captured on a 6-point Likert-type scale. The COI has evidenced good psychometric validity and reliability in other South African samples (Coetzee & De Villiers, 2010; Coetzee & Schreuder, 2008, 2009a; 2009b; Ellison & Schreuder, 2000; Van Vuuren & Fourie, 2000), with Cronbach's alpha coefficients varying between 0.46 and 0.85 in these studies. In accordance with the guidelines provided by De Vos, Strydom and Fouche (2009) and Foxcroft and Roodt (2001), the psychometric properties of the PMAI and the COI were regarded as acceptable, as the study aimed to measure broad, group-based trends for research purposes. Ethical clearance and permission to conduct the study was obtained from the management of the organisation that participated in the study. Participation was voluntary and employees were given the opportunity of attending one of several allocated sessions. At the beginning of each session the researcher explained the purpose of the research, and participants were assured of confidentiality and anonymity and the voluntary nature of participation. A cover letter was provided that explained the purpose of the research, procedure, potential benefits, confidentiality, anonymity, participation and withdrawal. All participants also completed a written consent form. Participants completed the questionnaires in the session allocated for this purpose, and they returned the completed questionnaires to the researcher and psychometrist who coordinated the session. The Statistical Program for Social Sciences (SPSS, 2008) was used to analyse the data. Descriptive statistics, correlational and inferential statistics were calculated. Cronbach's alpha coefficients were used to assess the internal consistency of the measuring instruments. Pearson product-moment correlations were calculated to assess the direction and strength of the relationships between the variables. In order to counter the probability of a type I error, the significance value was set at the 95% confidence interval level (p ≤ .05). For the purposes of this study, r-values larger than .30 (medium effect) (Cohen, 1992) were regarded as practically significant. The f-test was used to compute the differences between groups (Black and White people, males and females, single and married persons, as well as permanent and parttime groups). ANOVAs were performed to test for significant mean differences between the various age groups. The means and standard deviations of each of the PMAI and COI subscales are presented in Table 3. Table 3 shows that the sage archetype (M = 4.04; SD = 0.41), was the dominant archetypal value for the sample. The innocent, destroyer and orphan archetypes had the lowest mean scores. The means and standard deviations of each COI subscale are represented in Table 3. Participants scored the highest on the lifestyle (M = 4.52; SD = 0.85), pure challenge (M = 4.50; SD = 0.91), service or dedication to a cause (M = 4.31; SD = 0.91), and technical or functional competence (M = 4.30; SD = 0.72) career orientations subscales. The general managerial competence career orientations subscale yielded the lowest mean score (M = 3.20; SD = 1.01). Table 4 shows that the innocent variable is only related significantly and negatively to the security or stability career orientation (r = -.16; p ≤ .05; small practical effect size). No significant correlation is observed between the orphan variable and the COI variables. The security or stability career orientation variable does not relate significantly to the creator, ruler, magician and sage variables. The lifestyle career orientation does not relate significantly to the destroyer and ruler variables. The autonomy or independence career orientation does not relate significantly to the innocent, warrior, caregiver, lover and destroyer variables. The significant correlations between the PMAI and COI variables were mostly small in practical effect size (r ≤ .29) with some exceptions of medium practical effect size (r ≥ .30 ≤ .50). Race: The f-test results in Table 5a and Table 5b show that the Black and White groups differ significantly with regards to the caregiver, seeker, destroyer and magician archetypal values. White respondents scored significantly higher on the caregiver variable (M Black respondents = 3.56; M White respondents = 3.89). Black respondents scored significantly higher on the seeker variable (M Black respondents = 3.68; M White respondents = 3.31), the destroyer variable (M Black respondents = 2.93; M White respondents = 2.67), and the magician variable (M Black respondents = 4.04; M White respondents = 3.69). The Black- and White respondent groups also differed significantly concerning career orientations. 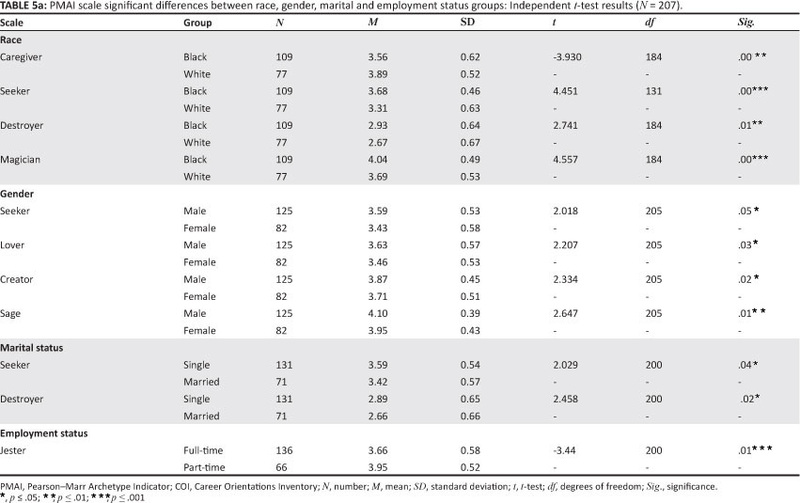 Black respondents scored significantly higher on the general managerial competence (M Black respondents = 3.43; M White respondents = 3.01), autonomy or independence (M Black respondents = 4.08; M White = 3.49), entrepreneurial creativity (M Black respondents = 4.40; M White respondents = 3.47), service or dedication to a cause (M Black respondents = 4.52; M White respondents = 4.06) and pure challenge (M Black respondents = 4.61; M White respondents = 4.34) career orientation variables. Gender: The f-test results in Table 5a and Table 5b show that men and women differed significantly on the seeker (M male = 3.59; M female = 3.43), lover (M male = 3.63; M female = 3.46), creator (M male = 3.87; M female = 3.71) and sage (M male = 4.10; M female= 3.95) archetypal values. Male respondents scored significantly higher than female respondents on all these archetypal values. The male participants also scored significantly higher than the female participants on all the career orientation values. Males and females also differed significantly regarding general managerial competence (M male = 3.31; M female = 3.03), entrepreneurial creativity (M male = 4.21; M female = 3.58) and pure challenge (M male = 4.65; M female = 4.27). Marital status: The f-tests results in Table 5a reflect significant differences between single and married respondents concerning the seeker and destroyer archetypal values. Single respondents scored significantly higher on both the seeker (M single = 3.59; M married = 3.42) and destroyer (M single = 2.89; M married = 2.66) archetypal values. There were no significant differences between the mean scores of single and married respondents on the career orientations variables. Employment status: The f-tests results in Table 5a reflect that part-time employees scored significantly higher than fulltime employees on the jester (M full time = 3.66; M part-time = 3.95) archetypal value only. Age: The ANOVA results displayed in Table 6 shows that age groups differed significantly according to the ruler, magician and jester archetypal values. It appears that there is a linear relationship between age and the ruler archetypal value, as respondents in the age group 41 years and older scored significantly higher than respondents in the 26-40 year and 25 years and younger age categories (M 25 and younger= 3.76; M 26-40 = 3.95; M 41 and older = 4.01). Respondents in the 26-40 years age group scored significantly higher on the magician archetypal value than the 41 years and older and the 25 years and younger age groups (M 25 and younger = 3.75; M 26^0 = 4.03; M 41 and older = 3.87). The respondents in the age group 25 years and younger scored significantly higher than older respondents on the jester archetypal value (M 25 and younger = 3.88; M 26^0 = 3.73; M 41 and older = 3.57). The only career orientation that resulted in significant differences between the age group was the entrepreneurial creativity (M 25 and younger = 3.85; M 26-40 = 4.20; M 41 and older = 3.55) career orientation, with the 26-40 year group scoring significantly higher than the other two groups. The objective of the study were to explore the relationship between the archetypal values and career orientations of a sample of participants in the science and engineering sector, and to empirically assess whether or not they differed significantly regarding their archetypal values and career orientations. The archetypal values profile suggests that the participants felt strongly drawn to the archetypal value of the sage which indicates a strong desire for continuous learning. The three dominant archetypal values of the participants (sage, magician and ruler), suggest that the participants are currently in a phase of development in which they desire the power and authority to participate in challenging opportunities that allow them to develop their expertise and knowledge, and test their talents and abilities. One possible explanation for this could be that the characteristics of this archetypal value are socially desirable (Pearson & Marr, 2003) and, therefore, participants may be more likely to acknowledge its presence within their lives. A second possible explanation is that this archetype relates to the particular stage of life of the participants, namely the early life stage which is typically the stage in which young adults strive to explore opportunities for creative self-expression (Schreuder & Coetzee, 2011). The innocent archetypal value fell within the midrange scores but together with the destroyer and the orphan, received the lowest scores from the sample. Similar results are reported by Pearson and Marr (2003) and Els (2004). Pearson and Marr (2003) suggest that these results occur because the innocent and the orphan archetypal values consist of dependent characteristics that are not acceptable within the work environment. The destroyer is usually activated for short periods within an individual's life in order to provide strength for ending or changing difficult situations or relationships and would , thus, not be expected to be prominent in a large sample. The career orientations profile of the participants indicated a preference for the lifestyle and pure challenge career orientations, followed by the service or dedication to a cause career orientation. These preferences suggest that the participants' career decisions are mostly driven by their personal need for work-life balance, and their desire for the power and freedom to be exposed to tasks and situations that provide a constant variety of challenging opportunities for self-tests, and pursuing their personal values. These findings are in line with the archetypal profile of the participants described earlier. The findings of this study also confirm Feldman and Bolino (1996), Kniveton (2004) and Coetzee and Schreuder's (2008) observation that individuals are inclined to associate with multiple career anchors. A noteworthy finding from this study is the confirmation of the finding by Coetzee and Schreuder (2008) that indicates a noticeable shift away from the security or stability career orientation to the service or dedication to a cause and lifestyle integration, career orientations. Participants with the sage as their dominant archetypal value also seem to value the career orientation pure challenge. This is in keeping with Pearson's (1991) description of the sage as the sleuth archetype that is mainly concerned with understanding the truth of a matter and solving problems. Schein (2006b) describes individuals who hold the pure challenge career orientation as those individuals who define success as overcoming obstacles, and enjoy solving unsolvable problems along the way. Du Toit (2010) found in this regard that individuals with a pure challenge career orientation tend to perceive success according to the problems they have solved or the obstacles they have overcome. Participants with the ruler as their dominant archetypal value seem to value the career orientations of general managerial competence and entrepreneurial creativity. The ruler archetypal value focuses on the amalgamation of experience, knowledge and the efforts of others in order to govern or manage a specific area (Pearson, 1991). It is, therefore, possible that this archetypal value would manifest in the work environment as an entrepreneurial creativity or a general managerial competence career orientation. A study conducted by Coetzee and Schreuder (2009a) also indicated the general managerial competence and entrepreneurial creativity career orientations to have overlapping values. Within the work environment, the ruler archetype is focused on fulfilling management or leadership roles, meeting task roles and creating a better work environment for others. The participants who indicated the seeker as their dominant archetypal value were also likely to indicate entrepreneurial creativity, general managerial competence, autonomy or independence and pure challenge career orientations. This finding is in agreement with those reported by Coetzee and Schreuder (2009a) which indicated the general managerial competence, entrepreneurial creativity and pure challenge career orientations to have overlapping values. The seeker is usually activated by feelings of dissatisfaction, confinement and a constant search for something better (Pearson & Marr, 2003). The ruler archetype is also associated with a need to have and display materialistic tokens of success such as cars, houses and clothes (Pearson, 1991). Within the work environment this can manifest as a need to create something new. These individuals express a strong need to show others that they are good enough. Individuals with the entrepreneurial creativity career orientation view making money as a key measure of success (Schein, 2006b). These individuals continually need to reinvent themselves, their products, their services and their organisations. They always need new challenges and need to achieve more. Participants who indicated the seeker as their dominant archetypal value also displayed the general managerial competence and autonomy or independence career orientations. Individuals with the general managerial competence career orientation tend to strive for higher positions that entail more responsibility, seniority, financial rewards and larger budgets (Schein, 2006b). It is possible that these individuals have an activated seeker archetype that drives the search for growth. Individuals with the autonomy or independence career orientation experience an overwhelming need to perform things their own way, and find it difficult to commit to the organisation's way of implementing tasks, and tend to find organisational life quite restrictive (Schein, 2006b). Participants with a dominant seeker archetypal value also tend to have a dominant pure challenge career orientation. Just as the seeker archetype is constantly looking for new opportunities, new adventures or a new ways of finding identity and meaning (Pearson, 1991), individuals with the pure challenge career orientation need to constantly overcome newer and tougher challenges (Schein, 2006b). The pure challenge career orientation, thus, reflects another way in which the seeker archetypal value can manifest within individuals in the work environment. Participants with a dominant lover archetypal value seem more likely to have a dominant lifestyle integration career orientation. The lover archetype is indicative of a broader perspective on life (Pearson, 1991; Pearson & Marr, 2003) and it seems, therefore, logical that finding a work-life balance is the prominent career orientation of individuals with this archetypal value. The creator archetypal value showed a significant positive relationship with the pure challenge career orientation. This finding is not unexpected as both variables concern conquering and creating something new. The shadow creator is especially intolerant of routine tasks (Pearson & Marr, 2003), which is an intolerance that is shared by individuals with the pure challenge career orientation. Individuals with this career orientation need to test themselves constantly (Schein, 2006b). The pure challenge and general managerial competence career orientations both displayed a significant positive association with the warrior archetypal value. However, the presentation of the warrior archetype differs slightly in the two career orientations. Both career orientations include the competitive nature of the warrior archetype, which manifests in the pure challenge career orientation as a need to prove that he or she can conquer anything or anybody (Schein, 2006b), and in the general managerial competence career orientation as the drive to get ahead and advance up the corporate ladder (Schein, 2006b). The expression of the shadow warrior is also evident in both these career orientations and is associated with power and competitiveness. Moreover, interestingly enough, Schein (2006b) uses the word warrior to describe individuals with the pure challenge career orientation, specifically with reference to the shadow warrior archetype that makes these individuals difficult both as supervisors and as families to manage (Pearson & Marr, 2003). The shadow warrior is evident in individuals with the general managerial competence career orientation, when they dominate or suppress others as a result of their managerial or senior positions. The jester archetypal value is significantly associated with the general managerial competence career orientation. This archetype is significantly positively associated with wisdom and experience (Pearson, 1991), yet can be expressed in a different manner involving lack of respect for both authority and boredom with routine. The general managerial competence career orientation is also associated with wisdom, knowledge and experience, and tends to represent individuals with a high performance drive and sense of responsibility (Schein, 1990). The jester potentially provides the individual within a managerial role with the resilience to respond to, and deal with, highly stressful environments. Participants with entrepreneurial creativity or service or dedication to a cause as their preferred career orientations appear to be significantly associated with the magician archetypal value. These two career orientations seem to represent two different expressions of the magician archetype. In the entrepreneurial creativity career orientation the magician archetype relates to transforming an individual's reality, whereas in the service or dedication to a cause career orientation it is concerned with transforming the reality of others. When the magician is expressed as the entrepreneurial creativity career orientation, it involves the grounding of a vision (Pearson & Marr, 2003), and is often accessed in response to difficulty in the environment. When the magician is expressed as the service or dedication to a cause career orientation, the focus is mainly on the transformation of other people. The magician is often visible in individuals and in occupations such as doctors, psychologists or other health practitioners (Pearson, 1991). These occupations are also prominent in individuals with the service or dedication to a cause career orientation. Schein (2006b) specifically links the service or dedication to a cause career orientation with the helping professions such as medicine, nursing, social work and teaching. White participants obtained significantly higher mean scores on the caregiver archetypal value. This finding is similar to a finding by Els (2004). A possible explanation for this difference could be that the Black individuals were raised in an oppressive political system, which forced them to develop an active struggling and fighting mindset towards power (Els, 2004). The Black participants in the study had significantly higher mean scores than their White counterparts of the seeker, destroyer and magician archetypal values. These archetypal values are all associated with transformation. The seeker archetype is triggered by dissatisfaction and characterised by a longing for a better life, focused on personal growth, development and transformation (Pearson & Marr, 2003). The destroyer archetype is associated with forced change and often relates to injustice and powerlessness. The destroyer archetype may force transformation in order to change old ways of performing tasks. The magician archetype is associated with the transformation of both personal reality and the reality of others (Pearson, 1991). Within the South African context the concept of transformation is likely to be of particular importance for Black participants. Over the past 16 years the post-apartheid Black South Africans were catalysts for major transformations in South Africa. This political transformation was triggered by dissatisfaction with their circumstances and was eventually realised through forced change and power. This form of transformation is associated with the magician archetypal value (Du Toit, 2010). The results indicated significant differences between race groups in terms of to the entrepreneurial creativity, general managerial competence, service or dedication to a cause and autonomy or independence career orientations. Black participants scored significantly higher than their White counterparts on all of these career orientations. This finding contradicts the finding of Coetzee and Schreuder (2008), that Black participants had lower mean scores than other race groups regarding the entrepreneurial creativity career orientation. The Black participants also scored significantly higher than the White participants with regards to the general managerial competence career orientation, a finding which is confirmed by Coetzee and Schreuder's (2008) study. Coetzee and Schreuder (2008) suggest that these findings might be related to the Employment Equity opportunities that are currently available to Black employees within the South African organisational context. Pearson & Marr (2003) suggest that the archetypal scores of men and women differ. However, Els (2004) found no significant gender differences in archetypal values. In the current study males and females differed significantly in terms of the creator, seeker, lover and sage archetypal values. Although the present study expected to find gender differences, the gender differences reported in this study are different to those reported in previous studies. The male participants consistently scored significantly higher than female participants on the creator, seeker, lover, and sage archetypal values. This may be indicative of the patriarchal nature of South African society. Pearson (1991) emphasises that although gender identity is individual, it is also a cultural and political issue. The patriarchal nature of the male archetypal values is not a surprising finding within the historical context of female oppression in South Africa. However, the study's finding regarding the prevalence of the lover archetypal value in the male group, is contrary to Pearson and Marr's (2003) suggestion that women are more likely to reflect the lover archetype, as it contains values related to commitment and connectedness. The sage archetype is associated with behaviour characterised by fairness and objectivity, which are traditionally viewed as masculine traits. The finding regarding the prominence of the sage archetype in the male group is, thus, in keeping with previous research. Pearson and Marr (2003) state that the seeker archetype is more prominent amongst men, and this was the case in the current research study. However, Pearson (1991) states that the creator archetype is associated with both male and female development but in the current study the creator archetype was more prominent amongst men. The present study found differences in the career orientations of males and females. This finding contradicts the finding by Erdogmus (2004), who reported no differences between gender groups. The study found no significant gender differences in terms of the lifestyle integration career orientation. This confirms the findings of Coetzee and Schreuder (2008) but contradicts the findings of Danzinger and Valency (2006), who reported a significantly higher occurrence of the lifestyle integration career orientation amongst the women in their sample. In the current research males scored significantly higher on the pure challenge, general managerial competence and entrepreneurial creativity career orientations. These findings confirm Coetzee and Schreuder's (2008) suggestion that males are more needs and talent-orientated in their career orientations than their female counterparts. Men appear to be highly motivated by challenges and variety within their work environment. They also seem to require limited supervision from other people, as they prefer positions of authority. This finding supports earlier findings regarding the patriarchal nature of the South African organisational context (Els, 2004). The single participants within this study were more likely than their married counterparts to reflect the creator and the destroyer archetypal values. These archetypal values both form part of the inward journey phase of individual development, and are associated with the development of the soul through spiritual meaning making (Pearson, 1991). The creator and destroyer are not focused on commitment, but are related to a refusal to settle and to releasing things that are not related to one's own vision and standards (Pearson, 1997). No difference was found regarding the career orientations of groups with differing marital status. This is in accordance with the findings of Erdogmus (2004) but contradicts the findings of Coetzee and Schreuder (2008). Participants who are part-time employees were more likely to reflect the jester archetypal value. This finding corresponds with the expectation that part-time employees experience more enjoyment or joy, excitement, liberation and freedom, than their full-time employee counterparts and are, therefore, also more likely to be playful, curious, present-oriented, impulsive and unconcerned with the opinions of others (Pearson & Marr, 2003, p. 14). Full-time employee status is associated with values of safety, security and responsibility. No difference was found in terms of the career orientations of groups with differing employment status. During the early life career stage (25 years and younger) individuals are faced with challenges such as establishing their identity, developing autonomy and self-reliance, becoming established, becoming committed and being employed (Schreuder & Coetzee, 2011). This age group displayed a significantly higher preference for the jester archetypal value, which is associated with curiosity, playfulness, the expression of enjoyment and aliveness. The values associated with the jester archetype seem to reflect the developmental tasks of the early life stage, as these individuals are still predominantly occupied with exploring new opportunities for self-expression. During the middle life career stage (26-40 years) individuals are focused on refining their identity, clarifying values, pursuing occupational satisfaction, maintaining health and well-being and finding a balance between agency and communion (Schreuder & Coetzee, 2011). These goals relate to the underlying archetypal values of the magician, which was found to be most prominent amongst members of this age group. The magician relates to transformation within, and having the power to solve challenging problems in innovative ways (Pearson, 1991). These themes are in line with those often reflected in the needs related to the developmental life tasks of this age group (Schreuder & Coetzee, 2011). This age group also showed a preference for the entrepreneurial creativity career orientation, which emphasises a need for new challenges, freedom and power. The late life career stage (41 years and older) focuses on dealing with socio-emotional losses, making satisfactory physical living arrangements, preparing for retirement, maintaining health and emotional well-being, and contributing to society (Schreuder & Coetzee, 2011). This is consistent with the values exhibited by the ruler archetype, which was the most prominent archetypal value in this age group. The ruler archetype is mainly concerned with 'creating an orderly kingdom', having power and authority, or being in control, and finding ways to make one's fullest and most authentic contribution that benefits the greater good of all (Pearson, 1997). Because the present study has been limited to a sample of participants, predominantly employed in the science and engineering industry in the South African organisational context, the findings cannot be generalised to other occupational contexts. Furthermore, given the exploratory nature of the research design, this study can yield no statements about causation. Associations between the variables have, therefore, been interpreted rather than established. These findings, therefore, need to be replicated with broader samples across various occupational, race, gender groups and economic sectors before final conclusions are drawn about the relationship between individuals' archetypal values and their career orientations. The value of the findings obtained in the present study lies in the explanatory utility of the identified archetypal values that seem to relate to the motives, values and preferences associated with the participants' career orientations. However, each of the identified archetypal values is important only with regard to the conceptually related career orientation. Overall, it can be concluded that the values and qualities underlying the current active archetypal life themes, act as psychological forces that give impetus to the expression of the career self-concepts associated with the participants' dominant career orientations. Moreover, the findings suggest that the participants' archetypal values (as the sub-conscious psychological drivers of their behaviour) tend to be related to the particular life and development stage of the individual. These may provide broader meaning in understanding the career orientations that drive the diverse groups of individuals' career choices and decisions. In this regard, the constructs studied in the present study seem to provide a useful career counselling framework for increasing self-awareness, helping individuals expand their perspectives, and options, and find greater fulfilment and meaning in crafting their life journeys. This study represents original research that contributes new knowledge to the field of career psychology and career counselling practices. D.M.d.T. (University of South Africa) conducted the research and statistical analyses, and assisted with the writing of the report. M.C. (University of South Africa) supervised the research project and assisted with the data analyses, and the writing of the report.